This meditation will use a combination of rose quartz and Celesta. 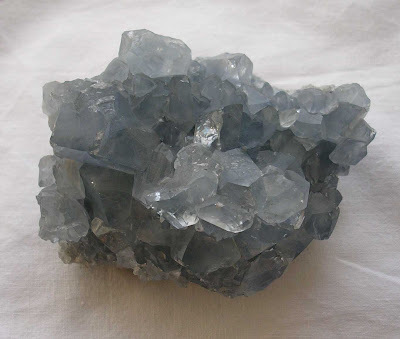 The rose quartz is to bring peace and healing, the celestite to empower this with angelic connection. Please use the image below as a positive focus and visit the link to Crystal Earthworks ( meditation page) if you are new to working in this way. In gratitude to all who are able to connect in tonight. The second of the projects 'Crystal Light Meditations' was held last Thursday - further details are on an earlier Blog posting dated 3rd October 2008. Please feel free to join us if you are based on or near the North Yorkshire Moors - the next date is Thursday 30th of October. I also had a crystal stall at a local craft fair last Saturday on behalf of the project. This was a really enjoyable day - thank you to all who contributed to its organisation and all those who came to look round. Please let me know if you are holding a similar event and are interested in having a crystal stall as part of it. A Crystal Earth Meditation was held for children across the globe last night at the Peace Sanctuary in Ripponden, West Yorkshire. These meditations are held on the second Wednesday of the month with the focus alternating between animals and children. If you would like to know more about how you can join in and empower this work further please visit The Crystal Earthworks link and go to the meditation page. This meditation will use rose quartz as a focus and feels to be for all in the times of challenge and unrest we and our planet currently face. Don't forget you can join in with these meditations from where ever you are across the globe - please visit the meditation page of The Crystal Earthworks link for further details.